A man who posted a comment on a regional daily’s Facebook page calling for a ‘batter gypos day’ has been cleared of inciting racial hatred. 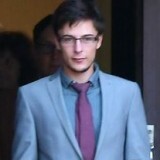 Joshua North, pictured, sobbed after he was acquitted by a jury at Grimsby Crown Court, following a trial which centred around a comment he posted on the Grimsby Telegraph’s Facebook page. Mr North, 25, had insisted he was joking when he posted the comment after the Telegraph ran a story about seven caravans which appeared in a car park in Cleethorpes in July 2016. According to the Telegraph’s report on the case, the prosecution had claimed that he targeted the travelling community, in particular gypsies. But, prior to being deleted, it had been seen by the chairman of the National Alliance of Gypsy Traveller and Roma Women, who reported the comments to Humberside Police. She claimed the post was “threatening, insulting, alarming and distressing”, adding it was “terrifying” that people could make threats on a public forum like Facebook and express views that supposedly exposed her community to hatred. Mr North said that he often posted “ironic comments or sarcastic comments” and did so as a form of satire, making fun of those who held bigoted or narrow-minded views. James Gray, defending Mr North, also claimed that there had been Facebook posts inciting hatred and violence which had not been pursued by police. The jury acquitted Mr North after just over an hour of deliberations, and a costs order in his favour will be made. Mr Gray said the prosecution had been brought with “the full force of the resources of the counter-terrorism unit”. Telegraph digital editor Jamie Macaskill told HTFP: “I am pleased the Grimsby Telegraph was not directly involved in this case and there was no suggestion that we held responsibility for individual comments posted on Facebook. “In this case the comment was quickly identified as being offensive and removed from our Facebook site. Gypsies remain a continual target for this kind of language and I wonder whether this ‘left-wing’-minded individual would have been acquitted had his remarks been aimed at an ethnic minority? Ah yes, the honest Romany turning up in their Transits, Mercs and caravans and leaving the council carpark/recreation ground/playing a scene of destruction after vacating their freeloading encampment following a court order. Well, that’s how it happens down here. And they sure as hell aren’t genuine gypsies. “National Alliance of Gypsy Traveller and Roma Women” Really? Yep, it exists. Very big on Hate Crime too. Hmmmmm. Very Orwellian that term. Well, that’s what I’m thinking, not saying. Damn, they’ll have me for Thought Crime now.